I’m really loving white and cream shades lately, especially for winter! Here are some of my favorites! Have a wonderful Wednesday! Loving these picks!! That oversized sweater is gorgeous!! Even during winter I love pulling out white. It’s classic for the season. That Nars lip color is perfect! 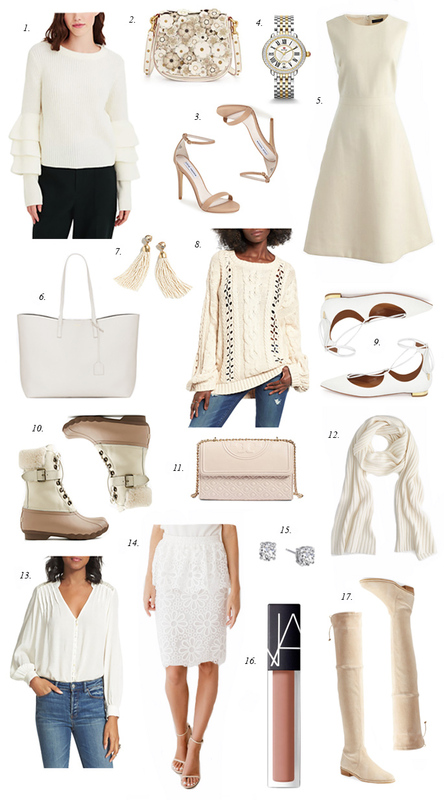 Loving the shades of whites and creams in your gift guide! These are gorgeous winter white pieces! I definitely want them all! Long live Winter Whites ;) I can’t get enough of that ruffle sleeve sweate. Such a fun twist without being an obnoxious pattern or something! Great picks, girl! Love that bell sleeve sweater! Perfect for the holidays. Awesome Roundup! Love white for winter time. I’m loving all of these pieces, Rach; I can’t even choose a favorite! I love wearing whites and creams during the fall and winter, too. Thanks so much for sharing and I hope you have a wonderful day! So many great finds…love that ruffled sleeved sweater! LOVE number eleven! I can’t wait for Tory Burch to have their Black Friday sale! I love winter whites! And those SW’s are GORGEOUS. But I don’t think I could ever buy them due to the fact that they would probably get so dirty right away and I would cry lol. That big chunky sweater is everything! Great roundup. I love winter white, especially as an accent piece, such as a bag or scarf. Great picks! Love these picks and especially that sweater! The ruffles on the arms are so gorgeous and fun!! Oh how dreamy! I just love all winter white looks and these are all great options. Thanks so much for sharing and have a lovely day! The second bag is a dream. Such a pretty selection! I love it especially the white peplum skirt! Thank you! Yes I love that one too! All of these pieces are so pretty! I’m obsessed! Those Stuart Weitzmans are so chic in winter white – loving these picks! Love love love the ruffles on the first stop!